Step 1: in the first place, go to WhatsApp and create backup of your conversations from Settings. That’s only if you want to keep them once you’ve installed this MOD. Step 2: now go to the Settings menu on your phone and from Applications you have to uninstall the official WhatsApp app. Otherwise, it won’t let you install YOWhatsApp because the system will detect it as a duplicate app since it’s based on the same source code. 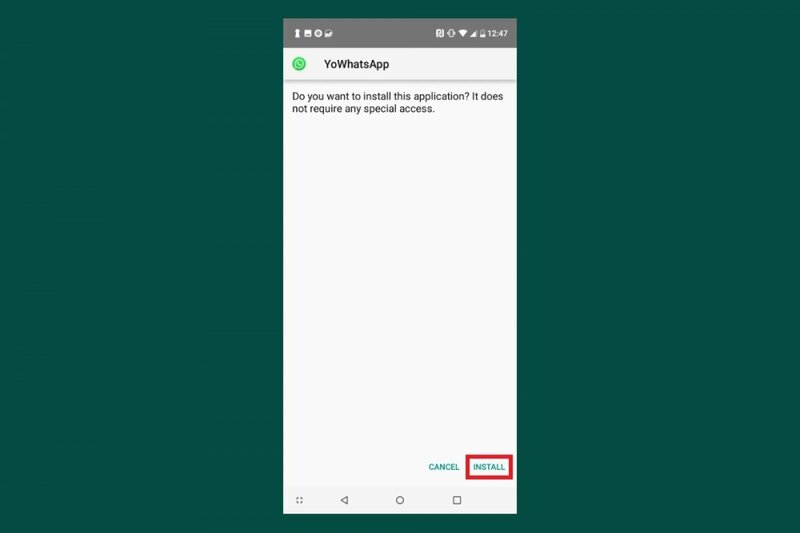 Step 3: now you have to download the APK of YOWhatsApp. You can do so from its datasheet at Malavida by clicking on the green Download button. To be able to keep that APK, you’ll previously need to go to the Settings menu and enable the download of apps from Unknown Sources in your Security options. Step 4: once downloaded, open it from the notifications tray or accessing your download folder through a file explorer. Just tap on its icon to launch the installation process. Step 5: once the installation has been completed, you can open the app and insert your phone number to be recognized as a user of this service. We have to carry out this procedure because, as you probably know, YOWhatsApp isn’t available on the Google Play Store because it breaches its rules and it doesn’t look like it’s going to be available on the official marketplace anytime soon. That’s basically because WhatsApp Inc. hasn’t authorized the development of apps based on the official one even if the latter improve the service or come along with important new features.